At least 17 people were killed and some 40 left wounded in Egypt on Sunday as the country marked the fourth anniversary of the “25 January Revolution” which ousted former president Hosni Mubarak after a 30 year rule. The most intense clashes happened in the northern Cairo suburb of Matariya, a Muslim Brotherhood stronghold, where at least eight people were killed, including one policeman, Reuters reported citing Egypt’s health ministry. There have also been reports that one child of a Coptic family have been among those killed. Chanting “down with military rule” and “a revolution all over again”, demonstrators threw Molotov cocktails at security forces, which took retaliatory measures. Another six people died in protests spanning Egypt’s second biggest city, Alexandria, Giza Governorate, outside of Cairo, and the Nile Delta province of Baheira, according to security forces. 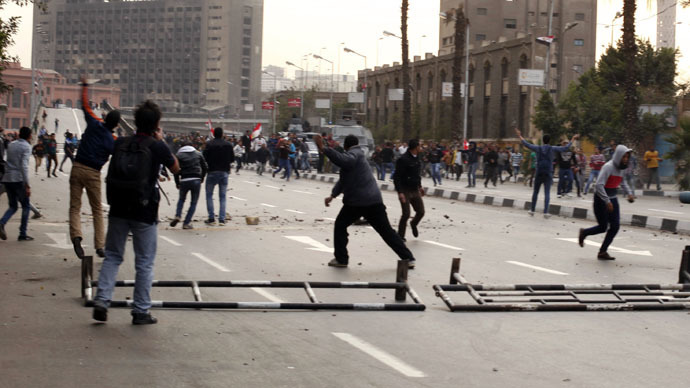 In central Cairo, roads have been sealed off and security was ramped up over the weekend. Streets leading to Tahrir Square, the cradle of 2011 revolt, have been closed after Islamists called for protests against the government of President Abdel Fattah al-Sisi. Dozens of protesters were killed during last year’s anniversary. This year, the police spread out in the capital, concentrating themselves around Cairo's iconic Tahrir Square. Security forces used tear gas and fired shotguns to disperse hundreds of protesters who tried to march on the square. Police have detained at least 132 people as initiators of disorders, including two Islamists, near Tahrir Square. Earlier, on Sunday in the Alf Maskan district of Cairo, two policemen were wounded in a bombing. Sunday has already been described as the bloodiest day of protests since Sisi was elected president last June. The first victims appeared on Saturday. A female demonstrator was killed during a leftist protest in central Cairo. Thirty-four-year-old Shaima al-Sabbagh, the mother of a five-year-old boy, died of birdshot wounds, which was confirmed by a ministry of health official, as she marched peacefully to lay a commemorative wreath of flowers on the eve of the anniversary. “Shaima was killed in cold blood,” Medhat al-Zahid, vice president of the Socialist Popular Alliance Party, of which Sabbagh was a member, told a news conference. Sabbagh’s death is the second of two female protesters in recent days. Activist Sondos Reda, 17, was shot on Friday in the protest in Alexandria. President Sisi’s critics accuse him of restoring authoritarian rule and repealing freedoms won in the uprising that ended nearly 30 years of Mubarak’s rule. In his TV address on Saturday, Sisi approved of the will for change that Egyptians showed in the uprising in 2011 but said it would take patience to achieve all of “the revolution's goals”.